Five years ago this month, Yesterday’s Movies officially began. To celebrate half a decade of movie reviews, I’m rewatching some of the highlights and giving them second-look reviews. 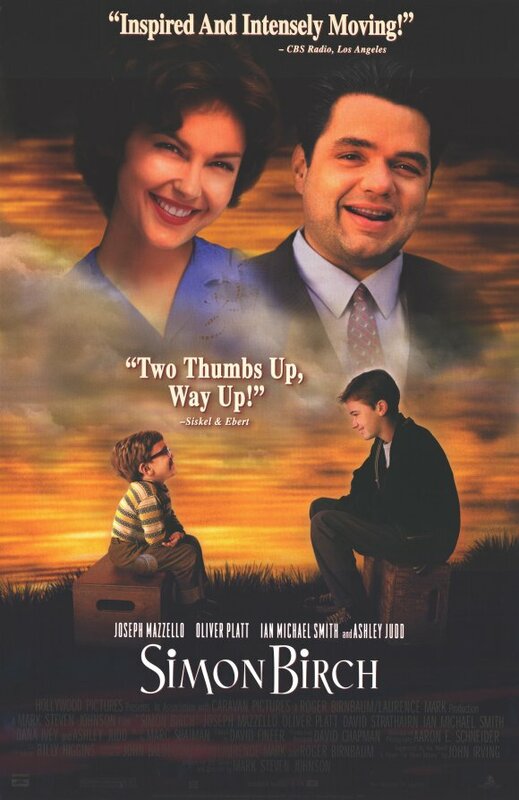 I’m closing out this series with the very first movie reviewed here, Simon Birch. I know I originally chose this one because I’d just read the book it was based on, A Prayer for Owen Meany, and I recall it ended up not having much to do with the book. I also think I remember Christmas being a major part of the movie, being a major episode somewhere in the middle of a story told over about a year or so. I’m not sure if I said something about it in the original review, but I’m recalling a feeling very similar to The Best Christmas Pageant Ever. oddly. That and the bus scene are all I really remember. Joe Wenteworth’s best friend, Simon Birch, was born tiny and has grown up tiny. The Birches never paid him much mind, so Simon is more a part of Joe’s family than his own, even though Joe’s family consists of his mother, his disapproving grandmother, and his grandmother’s maid emerita. Simon is convinced that God has a plan for him, that he’s God’s instrument, and one day God will make him a hero. As they go through their coming of age, Joe’s faith is shaken and Simon’s is tested, and they both want to know who Joe’s real father is. Maybe after all these years, the movie stays with me more than the book, but it felt like it came a lot closer to it than I recall it getting credit for. As it went on, maybe it eventually had to stray further from it to make it fit into the format, particularly in the way everything suddenly happens on one really bad day, in a way that ends up minimizing Simon’s involvement in the revelation of Joe’s father’s identity, the question in the foreground of the entire movie. The adults who aren’t Joe’s mother or her latest boyfriend come off terribly. At times it seems like this is meant to be an exaggeration from the kids’ point of view, but it doesn’t quite make it, and Miss Leavey and Rev. Russell, who are admittedly in positions that would be trying, appear to be handling the children much more harshly than is justified. The chief reason this cannot be a point of view issue is that Ms. Wenteworth completely agrees that they’re out of bounds. As it was my very first review, it’s understandable that I spent most of it making direct comparisons to the book, which is something I decided to minimize in reviewing adaptations later on. I still managed to talk about things unrelated to the book, which is a pleasant surprise. Of course, I still wish they hadn’t made Simon’s “voice like a strangled mouse” a mostly informed trait, but I appreciated Oliver Platt’s performance a lot more, and while Owen in the book may ruin the pageant in a way more appropriate to the character, and Simon’s lapse of control in the manger is inexcusably rapey, the rest of the film around it does make the boys’ budding sexuality a theme, so it’s a moment that does grow organically. I think the distance from my experience with the book has done good things for the movie. It feels much more like a reasonable encapsulation of the doorstopper into a two hour format than a betrayal now. Maybe my more general expectations of adaptations have also relaxed. Altogether I feel this was a pretty solid first review, and I’m glad to have come back to it. Five years on, I’m still doing more or less the same thing I set out to do. I’ve been incredibly lucky to have been able to do this week after week without having to make any drastic changes and only having to post a non-review update an average of once a year. The biggest change I can think of over the last five years has been dropping the watch/don’t watch taglines, which I don’t feel the blog has suffered from (especially since I realized a few months in that I stole the gimmick from Shirt.Woot.com’s product blurbs). I’m also lucky that what started as shouting opinions into the ether has found something of a (mostly silent) audience. If I hadn’t had evidence people were reading this, there are several times over the last few years I may have quit. I started this blog because I wanted to challenge myself to create regular content in an online brand, and I met that challenge thanks to my readers. I weathered some busy college semesters, dramatic reversals of fortune, and major life changes, and Yesterday’s Movies is still today’s review blog. Here’s to five more years’ shouting opinions into the ether. It’s amazing how ether listens. For a fascinating book/movie comparison, try 101 Dalmations — don’t suppose it could fit this format, since you want previously unwatched movies, but good story aside, this is arguably the best adaptation i’ve come across, while in NO way slavish.